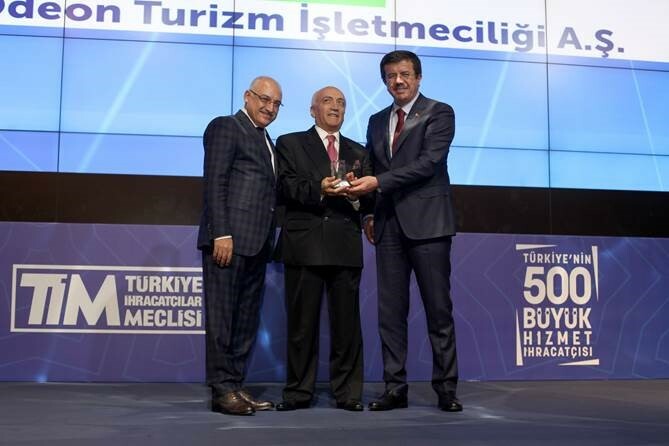 ODEON Turizm İşletmeciliği A.Ş., an OTI Holding affiliate, has won the second prize in the travel agency services in the rating of Turkey's 500 Great Service Exporters. The research called “Turkey’s 500 Great Service Exporters” organized for the second time this year by Turkish Exporters Assembly (TIM) with the contributions of the Ministry of Economy has been completed. Odeon Turizm İşletmeciliği A.Ş., an affiliate of OTI Holding which has celebrated its 25th foundation anniversary this year, has become the second company that had brought Turkey the highest amounts of foreign currency in the travel agency services thanks to its declaration of 107 million 815 thousand dollars for the year 2016. The top 10 firms and the top 3 firms that have achieved the highest export figures in 17 sub-sectors have received their awards in a ceremony attended by the Minister of Economy Nihat Zeybekci, the Minister of Finance Naci Ağbal, and the Minister of Customs and Trade Bülent Tüfenkci. In the ceremony organized in Raffles Hotel on December 15, the Management Consultant Haydar Aksu received the award on behalf of Odeon Turizm İşletmeciliği A.Ş. that has ranked second in the travel agency services from the Minister of Economy Nihat Zeybekci and TIM President Mehmet Büyükekşi. Odeon Turizm İşletmeciliği A.Ş., which ranked first in its sector in the year 2016, has been awarded for two consecutive years.